Does anyone maybe know what tyres Ferrari chose for Baku F1 compare to RB & Merc ? A fortnight is too long to wait after this race! It feels so unresolved. Congrats to redbull of course but without luck they didn’t have the pace to even be on the podium. Bad luck AND bad strategy for both Ferrari and Mercedes. What a weird and anticlimactic race. I’m sure if you’re a Daniel Ricciardo or redbull fan you feel otherwise but this race felt manufactured, where as Bahrain was equally thrilling (if not more so) and far more organic. I get the need for the safety car at that point (arguably, could have used VSC, double waved yellows, etc) but in as many ways as it spiced the race up, it ruined it. When seb made its pitstop yesterday. Our car was the Best for this race next red bull third Mercedes. Has Ricciardo ever won a straight race with no SC or issues for others? Yup we are certainly the best team at the moment and I think we have a lot more to come, looking like a good season but things can change quickly so it's a shame we have not won all 3 races so far. But Mercedes are leading WCC. Would you swap positions with them? lead driver not doing too well, no wins? well that's the worrying part, they can lead wcc without winning. What happens when they start winning again? I think the closest he got to winning on merit was in Monaco when RB forgot his tyres. Nope, he actually said yesterday all his wins came chaotic. Thats why I think Max is better driver and talent because he went toe to toe with Merc and Ferrari in last 3rd of 2017 season and took 2 wins, while Ric drove like he was non existent. Did anyone notice any car updates for China? I thought a new floor was being delivered but didn't see any differences. Maybe they were saving it for Baku. Based on the pace the car didn't need much anyway. It was a disappointing end to the weekend from Vettel, but he can take heart from it now appearing that Ferrari hold the best package in F1 2018 rather than Mercedes. What an awesome race, even if it was, for us a missed opportunity. I think we can safely say we have a car capable of winning championships. We need to win the development race through the year, but for now our car can be a winner. Perhaps we were a little too reactive in our strategy to what happened in Bahrain with Merc going to the medium in our thinking here. We let Merc dictate what happened by ceding the first move to them. What a drive by Dan. Whatever team he ends up at he just added 20% to his salary. I do hope we get him next year to replace Kimi as he retires. Leclerc may be a star of the future, but he needs to start beating his team mate and eliminating errors. Give him time, without the pressure of being in a red car to show if he can be a championship winner in the future. It seem more apparent to me the effect of the wash on Kimi's car as he tried to get close to Bottas to setup to pass. You could see how unstable his front-end was at various points on the track. Even though Kimi couldn't pass, it was clear we were being held up by the Merc. If Kimi was in front he would have run away I believe. I'm not going to dwell too long on the outcome, yes, it was a missed opportunity but there is plenty of great news from the first 3 races this year about our car, our drivers and our team. Maldonado had his chance. end of. He was more reckless and produced very little. Personal note but I believe the guy had spatial distorientation. Lower leagues ensuring that guys ended up in F1 were mature enough??? By this what do you mean? If it's F1 drivers crashing into other F1 drivers, get on youtube and look at compilations of drivers crashing into other F1 drivers...pick any name. And how long have you've been watching F1? F1 drivers crash into other F1 drivers - not with the consistency of Max. Where in my post did I state that F1 drivers do not crash into others at all?? 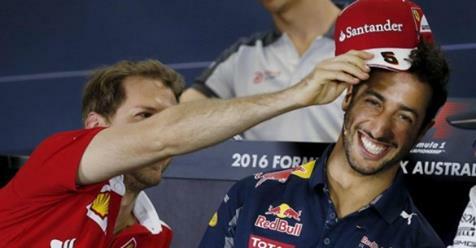 If the name of Maldonado and Max Verstappen starts appearing in the same sentence, you know that there is some issue. Its clear that it is lack of maturity in Max's case. I'm saying that F1 is not the stage where you come and then learn this level of maturity. I don't think Ricciardo has added any value to his name. He's a likeable guy, but he's not as good as Max or the other top drivers. He lucked into this race win. But, if rumours are true and Hamilton is asking for a crap load of money for his next contract, might be worth it for Merc to take Ric instead. As for Max... why not a 10 sec stop and go? It's not his first time, and sitting in the pits for 10 sec would have a least given him some time to think about the consequences of stupid moves. 10 sec time penalty is almost not even a penalty. Exactly as I thought. A 10 second stop-and-go would make a more sensible punishment rather than adding in 10 seconds into final timing. I believe Max is a talented driver, but he tends to act like a wild boar and lose it all on track by pushing too far which result in many unnecessary retirement / crashes with other drivers. It is a matter of time before RBR is running out of patience for giving a car to a driver only to be wrecked during race days. I'm not surprised if MB dump Hamilton in favour of younger and more talented driver. They should have anticipated a 4-time world champion digging for more cash. I believe I read somewhere that MB has either Sainz or Ocon on radar in case of any necessary driver replacement. Max sounds humble during this interview. I guess Seb talking to Horner and Marko then Marko having a word brought some humility in this kid. ( at 13:30). Will Buxton. Don't think it matters. The way Vettel has been driving, it's his team mates that need to worry. He's peaking again and he's got the team focused. Harmony at Ferrari like we haven't had since Schumy. Hoping to hear that Italian anthem after races many more times. Big credit to Ferrari for not over-reacting to the problems like they used to do. The atmosphere appears good while it is up to Red Bull and McLaren to do it. Lewis has his own problems he not one a race since austin thats 6 races ago. Mónaco, Hungary and Singapore RB win is a real possibility. Ferrari had a new pit stop procedure regarding the rear left at the Chinese GP. Leclerc, Vettel was the rage here all winter! It was Kimi on the podium , not Leclerc or Vettle. Ferrari's not in harmony, their in syncopation. Ok , their certainly was harmony during the Rubens days. Move over, and he did! Lewis has his own problems he not won a race since austin thats 6 races ago. I've noticed that this season Seb is much more mature. Probably the most mature he has ever been. I think last year the idea of winning the championship with Ferrari got into his head and he became hot headed. It was quite telling when he had no reaction to the Verstappen/Alonso incidents. Vettel from last year would have definitely had some words to say. He knows we have a great car, maybe even the fastest one as of right now so he is not too worried about the result. I think it helps his mood that he is leading the WDC and the car seems sound. It's too bad he couldn't have extended his lead over HAM to keep the pressure on.